The Tui Family HiTop 4+1 Campervan is one of our most popular vehicles. With automatic transmission, creative design and clever use of space means up to 4 adults and 1 child can travel and live in total comfort. 2010 models. This vehicle has been certified self contained. Can freedom camp in designated areas. The Budget 4 Berth has a shower & toilet, hot & cold running water, fridge, gas cooking facilities and LPG Gas heating along with a comfortable living and sleeping space for up to 4 adults. The convenient walk through from the driver's cabin to the living area allows for easy access to the rear. Large rear windows ensure great panoramic views. Volkswagen LT35, is a 2003 model or newer. An Interior refit in 2018 of new upholstery and curtains, and the furniture has been replaced where needed. The vehicle has been well maintained to the highest standards. Suitable for 4 adults. Two seats (with across the shoulder seatbelts) in driver's Cab (driver only has air bag) - three lap seatbelts in rear, plus one tether belt in rear. Capacity is 4 passengers only. Vehicle is certified Self Contained. 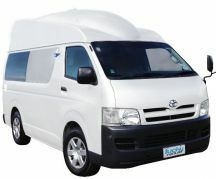 Toyota Hiace or similar, 2004 or newer with interior fitout: Custom Built Interior 2016-2018. 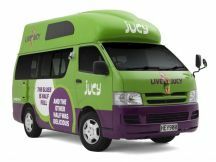 The Jucy Condo features a spacious kitchen and table area plus the essentials: a gas cooker, fridge, kitchen sink, fresh water tank, gray water tank and a casette toilet. Most models have a DVD player (Please request a DVD player if want one - free of hire). All that and it even sleeps four! Trust us when we say this vehicle is truly awesome! Seats 5 but only sleeps 4 people. This vehicle is certified self contained and ideal for freedom camping. This vehicle has two Baby seat bolts: either 1 baby seat, toddler seat or 1 booster seat, can be fitted. 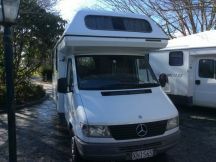 A well priced 4 berth motor home that is economical to drive.Seats 4 persons and includes everything you need for sleeping in comfort and cooking a meal, without compromising the care-free Happy Campers way of life. 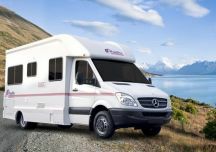 With a CD player, two double beds, toilet and shower and seating for four, this vehicle is the perfect partner for your New Zealand travels. 2003-05 Ford Transit. Childseat anchor point (x2) behind front seats. The Freedom Family HiTop 4+1 Campervan is one of our most popular vehicles. With automatic transmission, creative design and clever use of space means up to 4 adults and 1 older child can travel and live in total comfort. The extra vertical space in the living area creates an airy, spacious feeling and ease of movement - and a good-sized double bed and roomy loft bed makes for comfortable sleeping. Can hire extra items to sleep up to 5. Has a porta potty but no shower, cold water only. Toyota Hiace 2008. This vehicle is certified as self-contained. Can freedom camp in designated areas. The GEM is a sparkling example of a diamond class motorhome. Standing out in a crowd with streamlined aesthetics, unique seating/sleeping configurations (all seats forward facing and all 'ground floor' sleeping) and with unrivalled versatility, GEM redefines motorhomes for 1 to 4 occupants. Suitable for a couple looking for a little extra space and comfort, or for a family unit of up to 4 (2 adults + 2 children). Age 2016. Certified self contained and permitted at all freedom camping spots. Extra large outside storage lockers - USB input to stereo. You are viewing page 2 of 8.